** AA and CR2450 Batteries are Excluded. demos five applications with sample code across three devices. 1. When the temperature is over 30℃, two plugs will be turned on. 2. When the temperature is between 25℃ and 30℃, one plug will be on; the other one will be off. 3. Cool down the temperature sensor. When the temperature is below 25℃, both plugs will be turned off. 4. When the door sensor is open, two plugs will be turned on. 5. When the door sensor is closed, two plugs will be turned off. 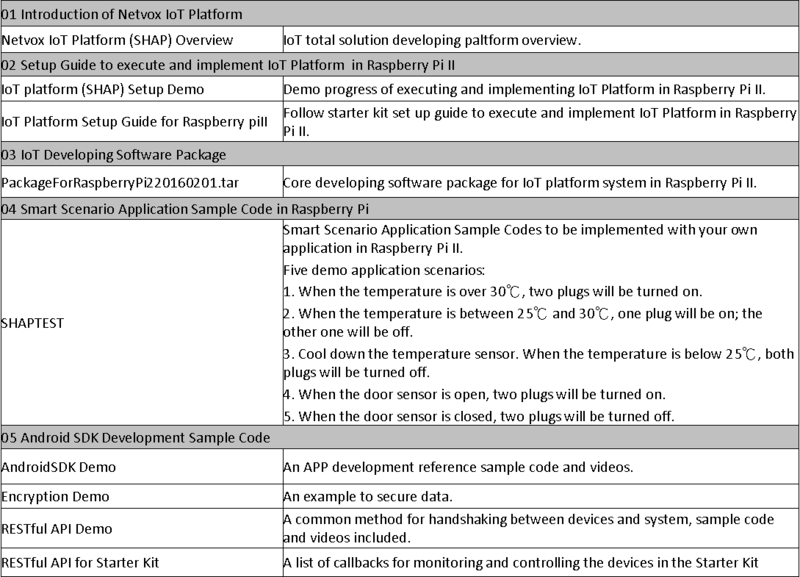 Follow starter kit set up guide to execute and implement IoT Platform in Raspberry Pi II. The free license enables users to design and evaluate the performance of ZigBee HA 1.2 supported devices. AndroidSDK is an APP development reference sample code. Encryption is an example to secure data. RESTful API is a common method for handshaking between devices and system . The three sensors can be used for a wide range of other applications. For example, the plug will be turned on when temperature is over 30℃. Two plugs will be turned off when the temperature is lower than 25℃. Existing systems can also be extended to over 150 ZigBee HA 1.2 devices and sensors made by Netvox. Such interactions between different systems bring a number of benefits to users. 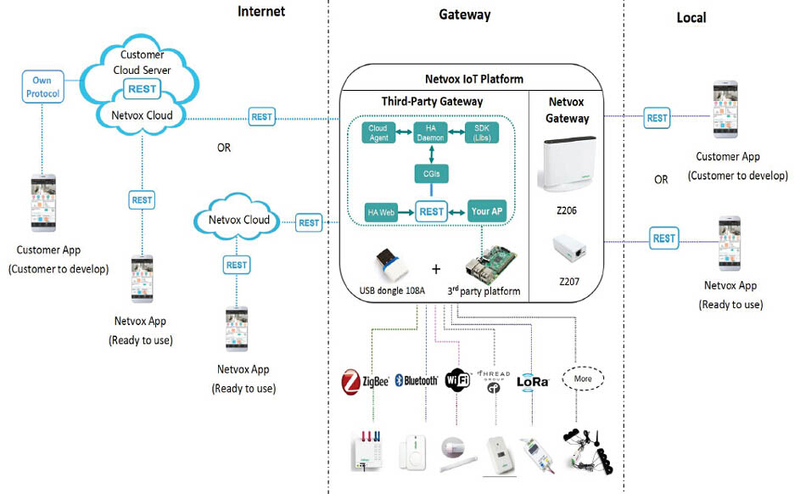 Build one app to control wireless devices in the home and work environments, leveraging IoT starter kit such as IoT total solution in all aspects of future applications. Remotely identify and diagnose devices. Remotely and securely access your products to diagnose and resolve issues. Automate software deployment and configuration management to many devices. Z108A: a ZigBee USB Dongle, acts as a coordinator in ZigBee network which is charged via USB connector and allows PC or a gateway to communicate in ZigBee network. Z809A: a smart plug and router that allows off site remote control. Users can monitor the load current, voltage, power, and kilo-watt-hour of the appliances. The reading can be reported for energy management. Z311J: a Window Door Contact Sensor, acts as an end device in ZigBee network. Z716A: a temperature and humidity display sensor, acts as an end device . The data can be sent to a data center. Netvox Cloud lets devices communicate with mobile and Web apps via RESTful API and meet the data collection, management, and analytics challenges of the IoT. 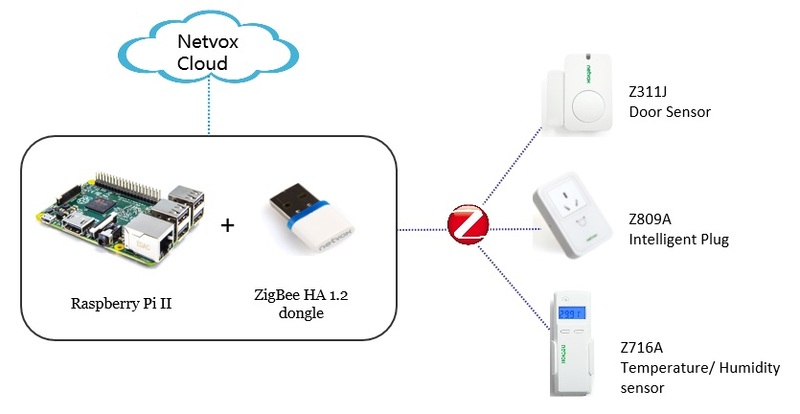 enables customers to control over 150 ZigBee HA 1.2 devices and sensors made by Netvox. IoT Solution Starter Kit Files, Sample Codes, Videos.